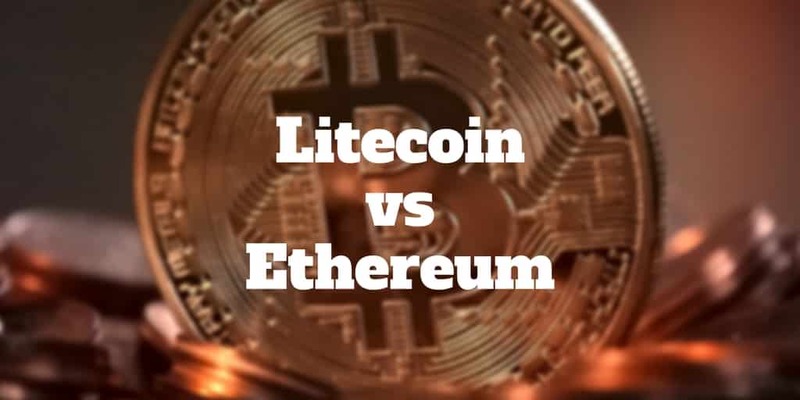 Home › Investing › Cryptocurrency › Litecoin Vs Ethereum: Which Cryptocurrency Is Best? Among cryptocurrencies, Bitcoin receives the most media headlines but did you know that less well known Bitcoin alternatives might be faster and have more functionality? Two of the leading contenders are Litecoin and Ethereum. When you compare Litecoin vs Ethereum, which cryptocurrency is best? Along with Bitcoin, Litecoin and Ethereum have grown like mushrooms in recent years towards multi-billion dollar market capitalizations but don’t let that fool you into thinking either cryptocurrency is a sure bet. Before speculating on either Litecoin or Ethereum, you should consider how comfortable you are owning highly volatile digital assets. In virtually the blink of an eye, the prices of cryptocurrencies have been known to swing by double digit percentages. Over time, they have created enormous wealth for some early adopters but prices can plummet so fast and soar so quickly that you may feel like you are on a rollercoaster ride if you track prices daily. With that consideration in mind, which cryptocurrency is best? Is it the relatively new cryptocurrency, Ethereum, which launched in 2015 and quickly rose to second in the ranks behind Bitcoin? Or Litecoin, the more established digital currency, that has been around since 2011? How Do You Buy Ethereum or Litecoin? How Much Does It Cost To Purchase Litecoin or Ethereum? Perhaps the biggest difference between Litecoin and Ethereum is that the former is a cryptocurrency only while the latter, Ethereum, is an open-source, blockchain-based distributed computing platform that can support smart contract functionality. That’s a complicated way of saying that Ethereum not only makes a cryptocurrency called ether possible, but can also support the launch of new cryptocurrencies and make it possible to crowdsource funding for new projects. The simplest way to think about Ethereum is to compare it to something you probably use every day, your mobile phone. If you have an Android or iOS phone, you have apps that can perform a wide variety of functions from ordering an Uber to mapping a route across town. Apps are written in a wide variety of languages for many purposes and can be downloaded by anyone. Similarly, Ethereum was designed as the foundational Blockchain layer that understands general purpose programming languages to bring flexibility to the blockchain world. So Ethereum is a general purpose Blockchain but what is a Blockchain? A Blockchain is a decentralized system that contains some kind of shared memory. For example, in the case of bitcoin, the shared memory is how many bitcoins everyone has at some time. A blockchain application needs to be decentralized and have shared memory. Once you have a decentralized Blockchain, you can build many things on top of it. The way it works is through what are called smart contracts, which are computer programs that control digital assets. With Ethereum, you can send ether to a computer program, which controls where the money goes. For example, it can send money to any address. Think about an insurance contract as a real life example whereby digital currency is sent to purchase coverage. Crowdfunding is another application example whereby if people contribute enough money within a certain time frame, a project is funded, similar to how Kickstarter works. If insufficient money is raised to fund a project then everybody gets refunded. These sets of rules can be applied to many applications beyond the financial world which is why a big challenge for blockchain developers is to figure out how to support the scale and size of the opportunity for blockchain applications in the real world. Currently, blockchain is not capable of supporting as many transaction as Visa processes payments or even Uber processes rides. For now, the blockchain is limited to more niche applications, though lots of work is being done to one day cater to the scale and size of the opportunity to disrupt everything from financial transactions on Wall Street to insurance purchases, and many more applications. Ethereum was created by Vitalik Buterin, who theorized that Bitcoin needed a scripting language for application development. The Ethereum blockchain is the foundation on top of which decentralized applications can be built. Imogen Heap used the technology to improve digital rights management for music. Augur and Stox have built prediction markets which are exchange-traded markets used for the purpose of trading the outcome of events. Digix has created digital tokens pegged to gold. Slock.it is using the technology to build smart locks, which are electromechanical locks designed to lock or unlock doors wirelessly based on cryptographic keys. Etheroll has built online gambling applications based on the Ethereum blockchain. RWE uses it for electric car charging management. uPort relies on the Ethereum blockchain to build secure identity systems for the internet whereby you don’t need a password to login. The Ethereum blockchain platform is estimated to have over 50% market share for initial coin offering projects, which is why Ethereum’s value is believed to extend beyond that of a typical cryptocurrency. Where Ethereum has potential beyond most other cryptocurrencies is that a coordinated effort has been launched to create a reference standard for the Ethereum blockchain that can be used to solve problems across a wide range of industries. The Enterprise Ethereum Alliance (EEA) includes many of the world’s leading companies, including Microsoft, J.P. Morgan, Deloitte, Accenture, BNY Mellon, Merck, Toyota, Mastercard, Cisco, Scotiabank, CME Group and even Cornell University’s Research Group. The idea is to come together to create a private permissioned version of the Ethereum blockchain that can be used to address problems in numerous industries, such as health, automotive, technology, banking, consulting, management, pharmaceutical and entertainment. The network effect of a coordinated group of leading Fortune 500 businesses joining forces to create a common standard adds a valuable dimension to Ethereum beyond what most other cryptocurrencies, including Litecoin, can offer. In a nutshell, Ethereum makes it possible to employ Blockchain technologies without having to start from scratch. Litecoin is a peer-to-peer cryptocurrency that is in many ways similar to Bitcoin because it relies primarily on the same open source code. It was released in 2011 by Charlie Lee, a former Google employee. The big difference between Litecoin and Bitcoin is in the speed of transactions. Litecoin is about four times faster than Bitcoin. Another big difference is the maximum number of Litecoins that can be created is 84 million while only 21 million Bitcoins can be produced. Similar to many cryptocurrencies, Litecoins are released based on a geometric series that halves every 4 years. And similar to Ethereum, Litecoin can be purchased at Coinbase. According to EtherScan, the total supply of ethers is approximately 97 million. To buy cryptocurrencies, you need a digital wallet. If you wish to buy Ethereum, you could visit a web wallet like Coinbase, which acts both as a broker to allow you buy and sell ethers and a wallet where you can store your purchase. Coinbase is accessible not only via the web but also on iOS and Android devices. It uses two factor authentication for heightened security. Another web wallet is MyEtherWallet, which differs from most other web wallets by keeping your Ethereum private key on your machine. By contrast, Coinbase stores your private key on hosted servers, which are insured. Other Ethereum wallets allow you to house your cryptocurrency too. For example, Ledger Nano S is a hardware wallet where your Ether is stored offline. Trezor is another hardware wallet first developed for Bitcoin that also supports Ether. If you prefer to store your digital currency on your desktop, Exodus support multiple cryptocurrencies including Bitcoin, Ethereum, and Litecoin. Another desktop wallet is Mist, which is the official Ethereum wallet. For cryptocurrency aficionados, MetaMask provides a desktop wallet that lets you store your Ethereum and access decentralized Ethereum applications. The value token of the Ethereum blockchain, ether, is listed under the symbol ETH on cryptocurrency exchanges. Litecoin is traded with the symbol LTC. If you wish to purchase Litecoin or Ethereum at Coinbase, you will pay a hefty transaction fee compared to the cost of buying stock on a brokerage platform like tastyworks or thinkorswim. Coinbase fees are subtracted from the amount entered to arrive at the total. So, let’s say you want to sell $100 of ETH (ethers) and the transaction fee is 1.49%, your total will be $98.51. When you use a credit or debit card, a fee of 3.99% is applied but that reduces to 1.49% using a Coinbase USD Wallet. Have you traded Litecoin or Ethereum? What do you think about cryptocurrencies? We would love to hear from you – share your comments below. ‹ What Is Citi® Private Pass®?